Jacksons Leisure are the UK's sole agent and distributor for JLS SatSeeker satellite systems. We are proud to represent this high quality brand in the UK which provides an affordable alternative to other premium brand names. 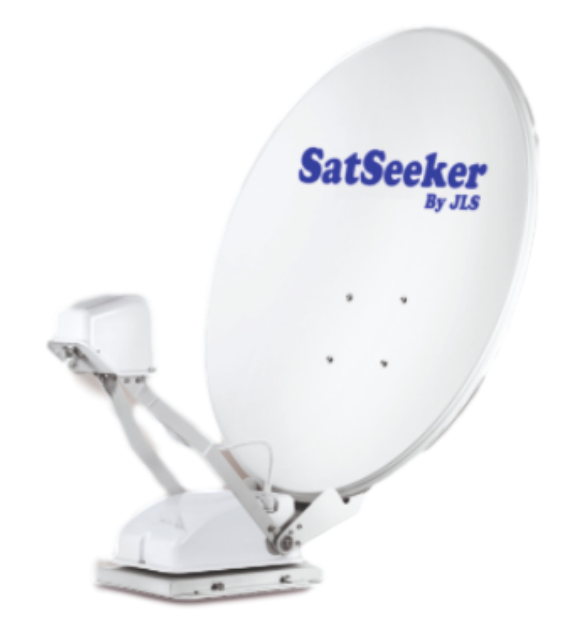 The SatSeeker dishes are extremely robust with an incredibly strong monoblock gearbox and motor drive assembly which is designed to give years of trouble free operation. It also boasts a Twin LNB output and autoskew functionality with GPS positioning as standard.. You won't find this high quality construction and functionality at these prices anywhere else in the UK. And it comes with a 5 year warranty as standard on the system. “If the Oyster Vision we sell, as the UK`s number one Oyster dealer is comparable to a BMW or Mercedes then the SatSeeker Satellite System is comparable with a Kia`s or a Hyundai. 10 years ago, there was a huge gap between these car models but these days that gap is minimal. I have owned BMW’s and Jaguar’s but now I own a Hyundai and I do not feel “in any way” I am driving an inferior car. It may not look quite as pretty as its most expensive competitor but build quality, and the incredibly strong monoblock gearbox and motor drive, will ensure many years of trouble free operation. Added to that the Quad LNB feed (as standard) is Sky Q compatible and for that feature alone competitors can charge five or six hundred pounds more!! Once again we have listened to our customers and delivered a Satellite System at a price that won`t break the bank!"